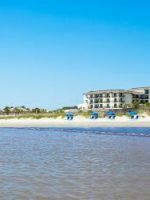 Located next to the beach, this oceanfront Days Inn is situated on Jekyll Island. Families will love exploring the nearby trails by bicycle (available for rent) or on a guided horseback tour. Deep-sea fishing, golf, dolphin tours, a turtle center and the Summer Waves Water Park are all nearby as well. 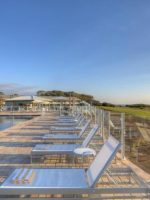 When you want to relax at the hotel check out the large outdoor pool where kids can swim and play and parents can hang out on the surrounding lounge chairs. A children’s pool is also available. The guestrooms feature one king or two double beds, a mini-fridge, flat screen television and complimentary Wi-Fi access is available so the whole family can stay connected. Rollaway beds and cribs are available upon request. Families can enjoy starting each morning with the complimentary hot breakfast buffet too. We come 3 times a year and are always pleased with the friendly staff and great breakfast. The facilities are well maintained and it is always a relaxing trip. 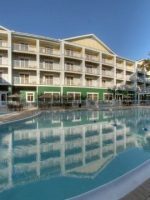 We enjoy the pool and hot tub and the uncrowded beach. Hubby and I escaped for a few days to our favorite place. This was our first time staying at this hotel. We were greatly impressed. Room was great! Easy access to the beach, pools, beautiful green space. We will be staying there again in just 8 weeks we enjoyed it so much.